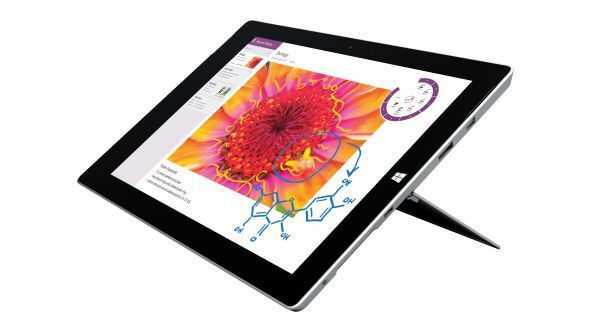 The Microsoft Surface Pro 3 and Microsoft Surface 3 are aimed at two different markets. Guess what? The Pro version is targeted at more productive usage scenarios!The screen is larger and the CPU used inside capable of much more processing than the Surface 3 but the Surface 3 is lighter, smaller and more efficient. In terms of real-world processing power the Surface 3 Pro is capable of giving the user a ‘barrier free’ office working environment. There’s enough processing power for Office usage, for some video editing and light gaming. Storage is also fast enough for very fast transfer speeds internally and over the USB 3.0 connection. The Surface 3, however, has ‘enough’ processing power for Office but is limited in media creation power and gaming power. There’s enough for most students and the pen, as on the Pro version, adds a lot of value to the student, presenter and for office note-taking and annotations, even when projected on a big screen. Both devices have a Type Cover and docking station available. Both device ship with Windows 8.1 Pro. Take a look at the table below to see all the important differences and use the selection tool below to find out which devices suits you. Full specifications and more information in our database. Full specifications and more information in our database.